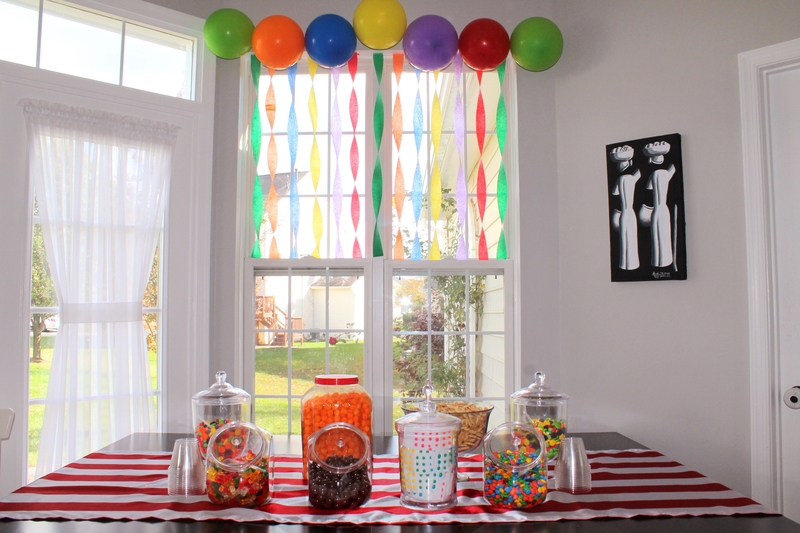 Well, of course, the main thing we need for a Candyland party is…tons of candy. I figured that the candy could serve as both the party decor and the party food, killing two birds with one stone. We tried to keep the rest of our budget very low. For our front entry, we displayed vintage gumball machines and I made topiaries out of Dum-Dums and floral foam. 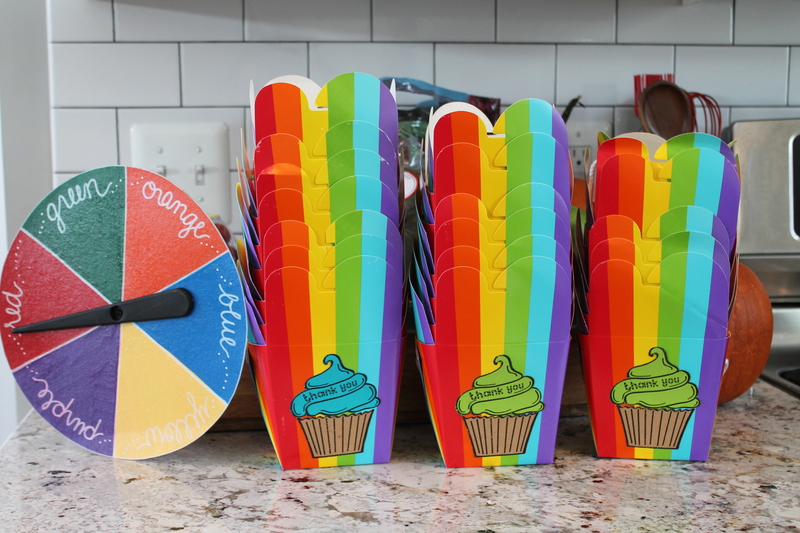 Jake helped me paint a few paper plates to look like colorful hard candies. 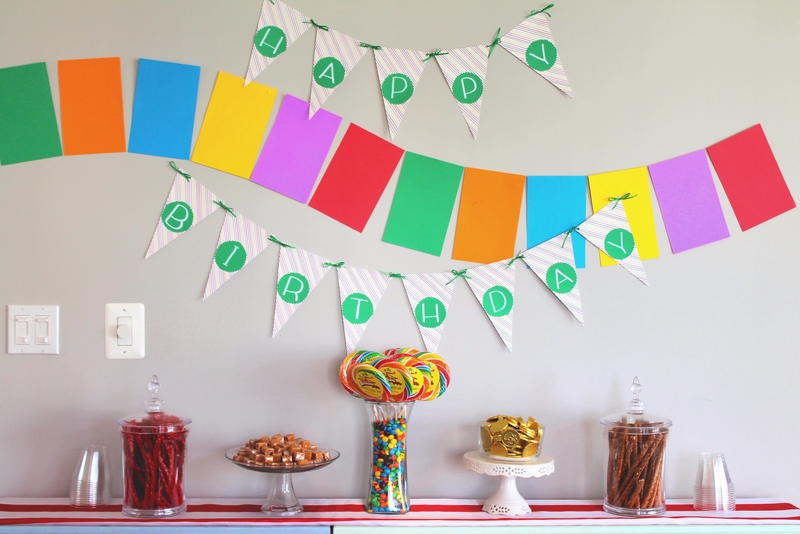 We made a new birthday banner and a cardstock candy trail to decorate the wall above the candy buffet. 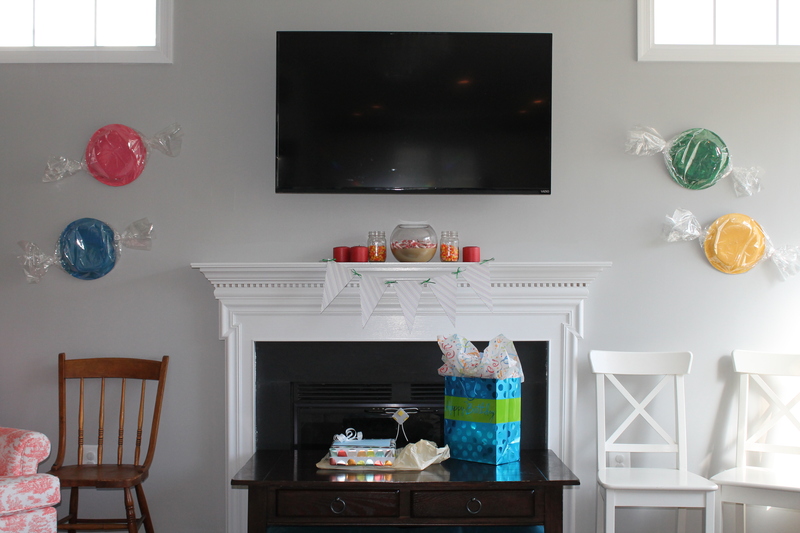 I bought a few bucks worth of balloons and streamers to incorporate the candy colors throughout the house. 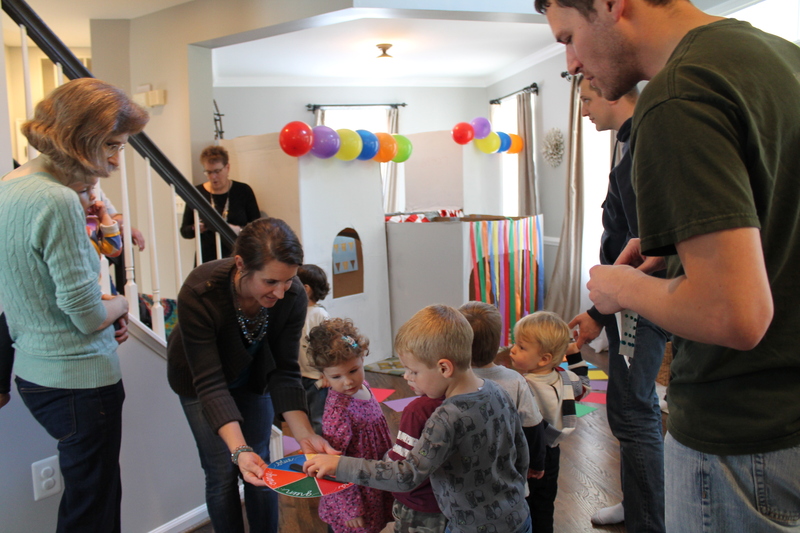 My kids were simply awed as a rainbow of balloons and crepe paper started to appear a few days before the party. And, for a few non-candy snacks, because I knew many of the moms (and adults at large) would want a break from the sweets, we also had pretzel rods, animal crackers, and cheese puffs. I totally meant to have popcorn as well, but I forgot to pop it! You can’t have a Candyland party without a candy castle! I snagged several refrigerator and washing machine boxes from Lowes (thank you, Lowes) and Dave constructed a humongous and amazing building out of cardboard and several pounds of duct tape. We whitewashed it with some flat white paint we had on hand. I originally intended to paint giant lollipops and gumdrops all over the exterior of the castle, but when push came to shove, we decided to go the simple route and use the streamers and balloons to decorate the castle, as well! Have I mentioned how much I love streamers and balloons? So simple, so inexpensive! 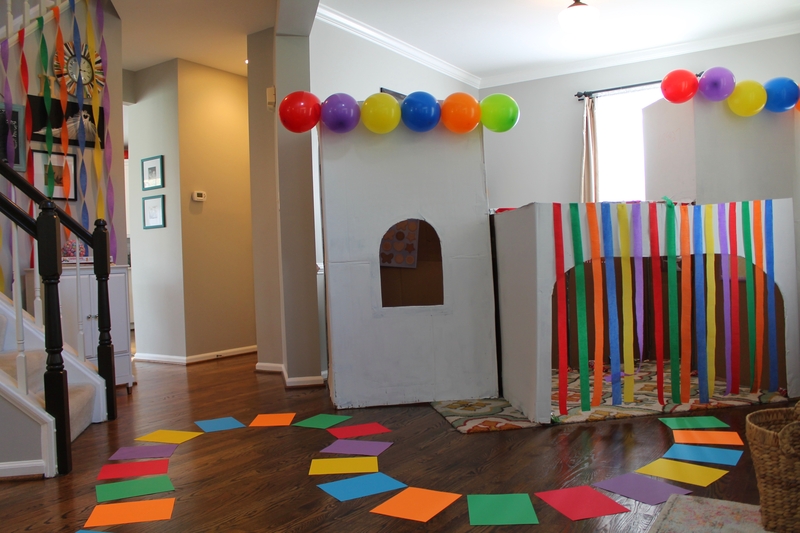 Our plan was to set up the candy castle in the yard and spray paint a brightly colored candy trail right onto the grass so the kids could play Big Candyland outside. However, on the day of the party, the wind was blowing so hard that we didn’t think anyone would have much fun playing in the yard. So, we moved a bunch of furniture around and dragged the giant candy castle into our house! Dave and my brother improvised a cardstock/construction paper candy trail taped to the floor. 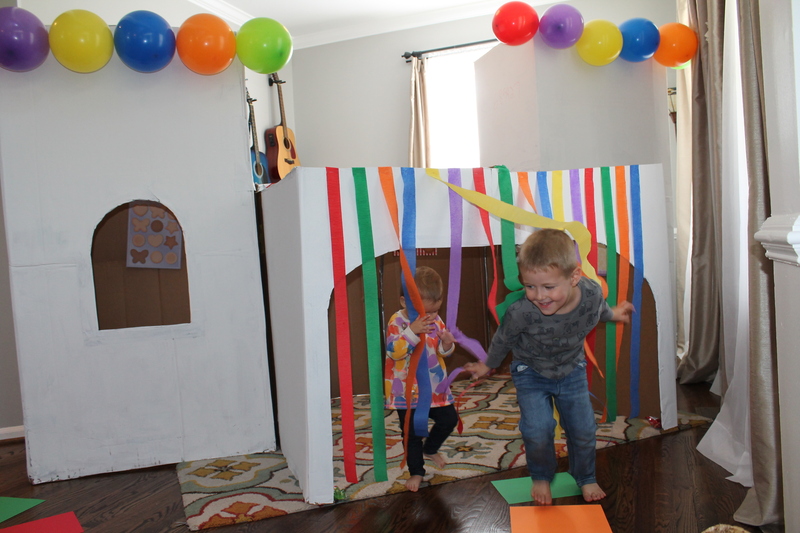 I was nervous about transferring the whole game play area inside, but it turned out to be a lovely limitation: parents didn’t have to work so hard to keep track of where their kids were, and everyone had many opportunities to race over the candy trail! I was super impressed with how two- and three-year-old kids were able to play Candyland and follow the rules of the game! They took turns spinning a color and stayed on their square while they waited to spin again! It was pretty darn cute. Finally, it wouldn’t be a birthday party without a cake. 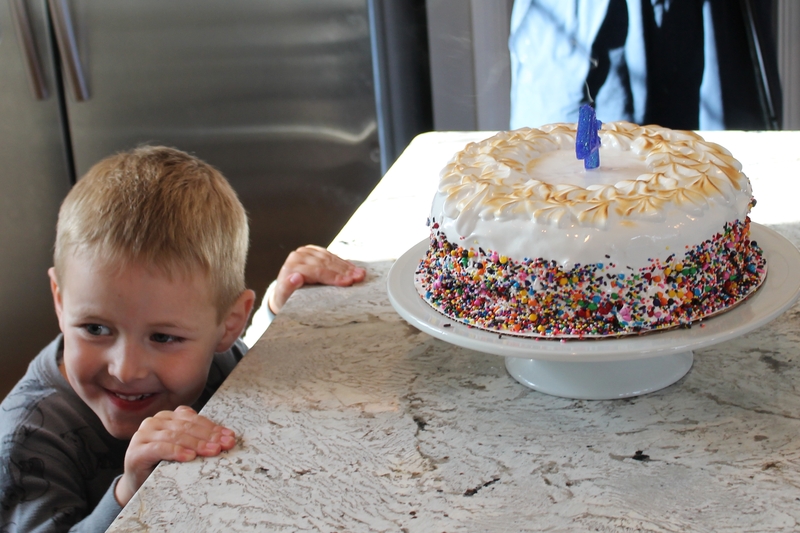 Jake was very specific this year: he wanted a s’mores ice cream cake. This combines several of his favorite desserts! That kid is smart. I will share more about this cake soon, but here is the overview: graham crusts, truffle brownies, toasted marshmallow ice cream, and brûléed marshmallow frosting. 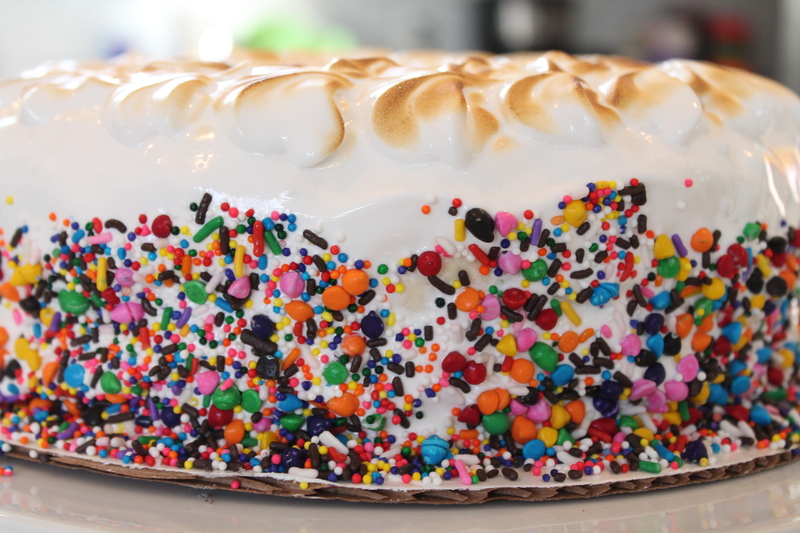 With, of course, a million sprinkles to fit the Candyland theme. 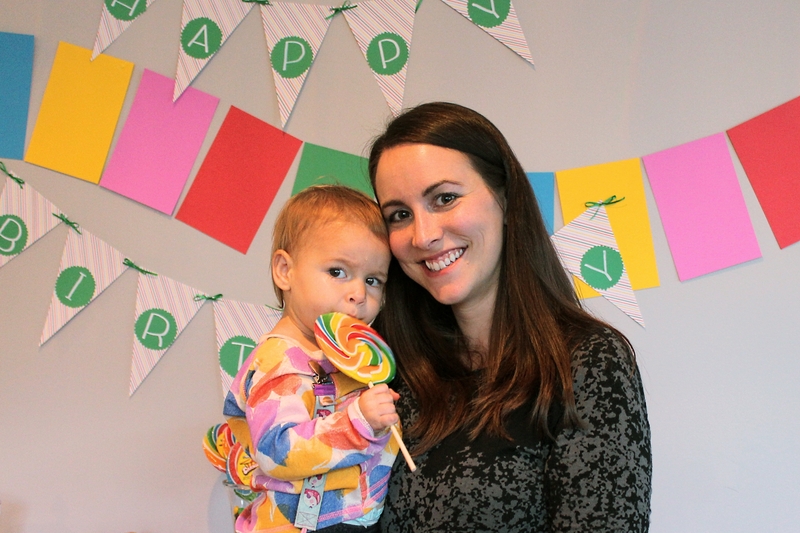 After a sweet time opening presents, we carried on eating sweets and playing Big Candyland! The candy was a big hit. Especially with little girls whose faces are the same size as giant lollipops. As the party wound down, we begged and pleaded with all of the guests to bring candy home with them in these cute takeaway boxes. Even after that, when the party was over, we still had enough candy to choke four horses. 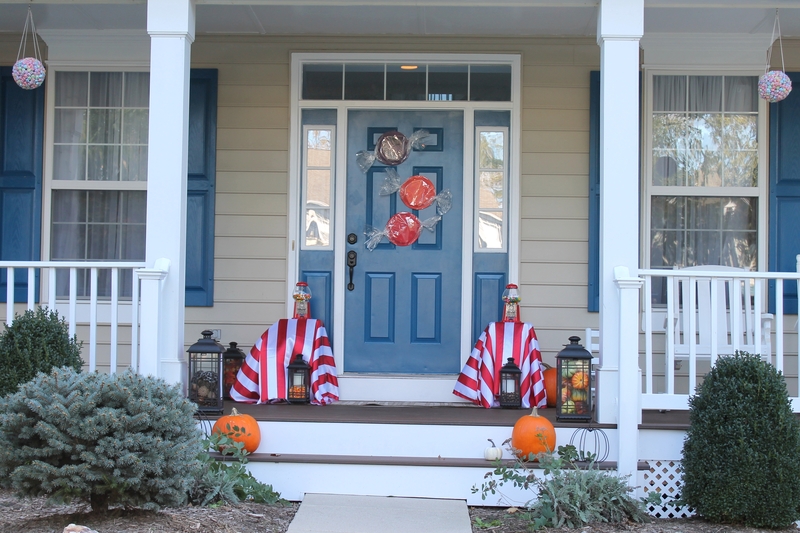 Happily, Halloween is just around the corner…. 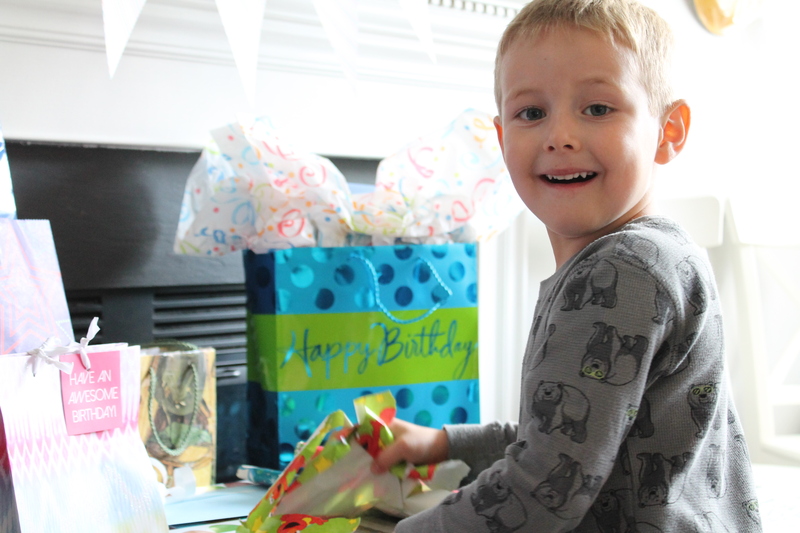 Happy fourth birthday, Jake! 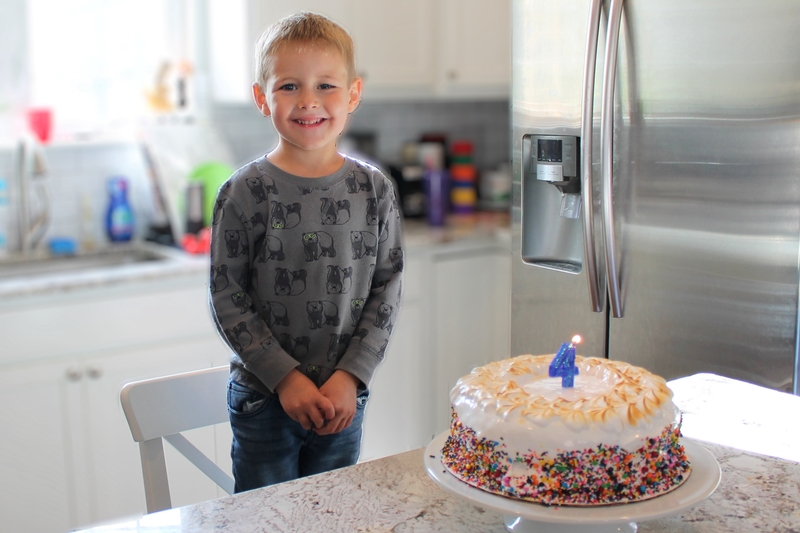 You are a bright and interesting kid, and we are amazed by how much you’ve grown in the last four years! Hi Melissa! 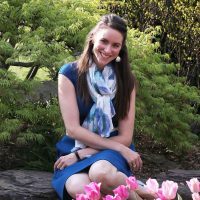 I am so glad I “found” you on FB so that I can now follow your blog. I remember how much we enjoyed talking about baking when you did your Senior project with me at Manchester. 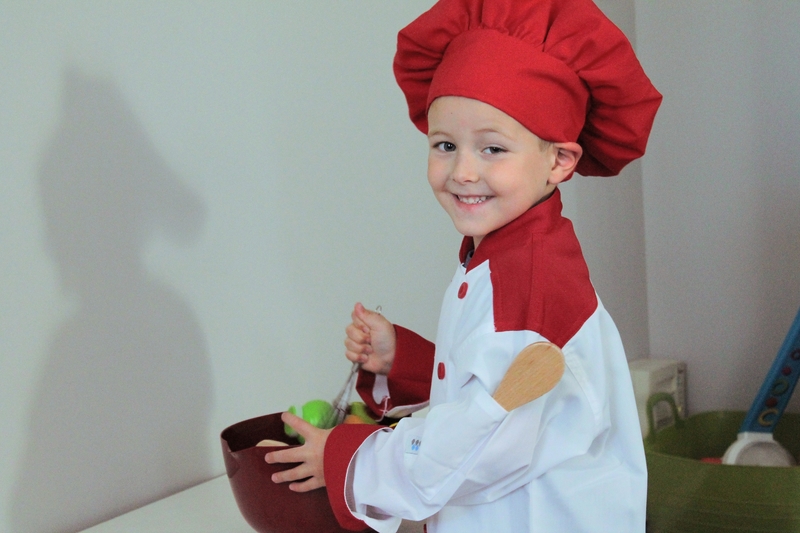 Your kiddos are adorable and you have become a very talented “party planner” and cook. Email me sometime and let me know your progress from MW to mom and food blogger. Thank you for your kind words, Barbara! I look forward to catching up!